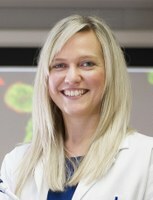 Alexandra M Davis is a PhD researcher in the School of Allied Health Sciences, Faculty of Health and Life Sciences at De Montfort University, Leicester. She completed her undergraduate degree in Biomedical Science at De Montfort University before going straight on to undertake her PhD. Her current research explores the role of the Epstein-Barr Virus in the development of cancer. One of the key focuses is the development of a novel 3D cell model on which to base future research.